If one of the following items is not true, and if the yacht is not constructed by the company SEAGULL Char à Voile (or all other legal authority that may have replaced it), then the yacht is not considered as a « monotype international Standart ». The length overall must not be longer than 4.15 metres. The diameter of the rear wheels must be 17 X 2.25 cm. The diameter of the front wheel must be 20 X 1.75 cm. The wheels are or are not covered with internal or external wheelcovers. The minimum weight of the yacht is 70 kg. The sail area is measured in accordance to the annex n° 3.A2 of the « Règlement International de Roulage et de Course (RIRC) ». 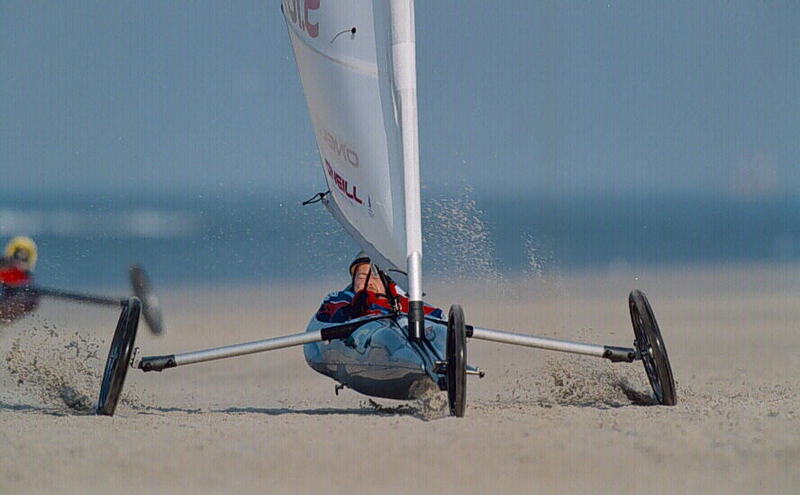 The maximum sail area is 5.80 m², mast, boom and fairings of the mast pocket excluded. The Standart logo is positioned in the upper part of the sail between the fourth and the fifth batten. The nationality character(s) are positioned between the third and the forth batten on both sides of the sail, and have to be lower at portside. The international sail number is positioned between the first and the second batten, and are higher at starboard. The colour of the character « S » is different from the colour of the numbers and is separated by a dot. Publicity is authorised between the boom and the first batten beginning from the bottom side of the rig. Only sails made by the companies SEAGULL and OMEGA (or all other legal authority that may have replaced it) are authorised. The length of the mast must not be longer than 5.50 metres. The bend of a « monotype international Standart » mast must be identical to any other « monotype international Standart » mast of another yacht. The mast is made of three parts. Stiffenings inside the mast are not allowed. The pulleys are fixed to the boom and the chassis by means of a rope of maximum 6 mm diameter.